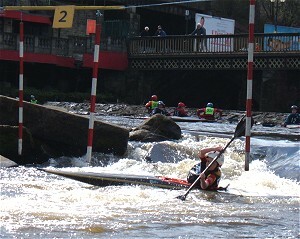 The white water course, developed to create a facility for canoeing using the weirs associated with the former mills, is on the River Calder in the centre of Sowerby Bridge. It is about 300m long and consists mainly of pool and drop rapids, generally grade 2, but in high water it can reach grade 3. The course is used for Div 2, 3 and 4 slalom competitions, general white water training and playboating. There is also plenty of flat water and some training gates upstream of the white water course. Halifax Canoe Club is based in the adjacent mill building (Greenups Mill) where there are changing rooms, toilets, showers and boat storage. Access to the course is via steps at each end. The event can be viewed from the riverbank or the floodwall in the mill. There is no car parking available on site. You can come in the Mill to drop off boats, but you must move cars straight away to nearby public car parks. The nearest and largest is a one minute walk. Please help us to maintain good relations by moving cars quickly. Camping and caravanning are not available on site, but there is a good public campsite at Triangle (5mins drive from the club). 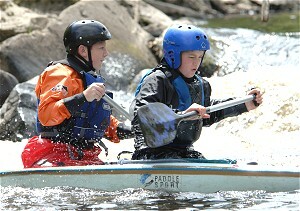 The white water course is available throughout the year for training or play. All that we ask is that you respect the mill residents. Any clubs or groups wanting to paddle are advised to contact us beforehand - we might be able to arrange for use of the changing rooms! Full directions to the club and a more detailed description of the course can be found on the club’s website. Event information will also be available about 6 weeks before each event.